Detailed review of Bioderma Hydrabio Gel-Crème. See what real experts and actual users have to say about this moisturizer. Bioderma Hydrabio Gel-Crème is a light facial moisturizer that is patented for ultimate hydration. Bioderma is a French skincare line with products made by biologists and dermatologists. A lot of people swear by French skincare products. I have tried some that are great, so I was interested to see what this Gel Crème could do for my skin. However, I was pretty disappointed in the long-term results. At first, I liked how thin it seemed, but it didn’t really hydrate my skin as much as I wanted it to. Especially heading into winter weather, I didn’t think it was moisturizer enough. After a few days, I developed little whiteheads on my cheeks, which I really didn’t like. It made my skin feel soft, but my skin didn’t seem any healthier. I also didn’t really see any change in my fine lines or complexion. The other issue I saw with Bioderma is the slightly higher price tag. I bought a 1.33 fl. oz. bottle for $24.90, which comes out to $19.15 per oz. It’s not the most expensive moisturizer, but I was definitely expecting better results. Overall, I had to give this a 2/5 stars, just because it didn’t really do anything for my skin and even clogged my pores a little bit. Bioderma Hydrabio Gel-Crème is a lightweight moisturizer with a gel-like consistency. It’s very thin, but not greasy at all. Applying is really easy! With the pump applicator, I needed about 1-2 pumps to cover my face and neck. The thin consistency makes application really fast. The pump never got stuck and worked well the whole time. Because of how thin this is, it dries pretty fast. It took about 1-2 minutes for it to completely soak into my skin. I liked that it didn’t leave a waxy film or anything. It even gave my skin more of a matte look once it dried, which I liked. The smell of this is light, but pretty sweet, like perfume. I didn’t mind the smell, but it definitely lingers even after it soaks in. Just after I put it on, I noticed a matte-like finish on my skin. I am guessing the dimethicone in this moisturizer helped with that. My skin felt soft and pretty hydrated, but it kind of wore off after about an hour. Longer term I was kind of disappointed. I didn’t really see any difference in my skin. It was slightly hydrating in the short term, but I felt dry patches develop over time. After a couple of days, I started applying it twice a day in order to see if I would notice more of a benefit, but it didn’t really change much. I also developed a couple of whiteheads after 3 days of using this, which was really disappointing. Overall, I think I am looking for something more hydrating in my daily moisturizer, especially if I am going to pay $24.90 for such a small bottle. Bioderma Hydrabio Gel-Crème contains a patented formula called Aquagenium. While there are some natural ingredients, this is definitely not an organic product, so if you are looking for chemical-free, this is not the product for you. One of the first ingredients listed in this moisturizer is Glycerin, which is a humectant. A humectant is something that pulls moisture to the skin to help enhance hydration. It is super common in skincare products. It also contains Tocopherol (Vitamin E), which is a natural antioxidant, meaning it can help skin look and feel younger. It has anti-aging effects and is also used to help heal scarring. Salicylic Acid is also really common in skincare products for people who struggle with acne. It is a chemical exfoliate and can help keep pores clear. Niacinamide, (Vitamin B3) packs a lot of power. It is said to help make pores smaller, fine lines less noticeable, and can also even out hyperpigmentation (dark spots) in the skin. A 1.33 fl. oz. bottle is $24.90. Overall, the price is pretty middle-of-the-line, but it seemed pretty high for something that didn’t produce the best results. It is more than most moisturizers you can find at a drugstore, but it is more affordable than a lot of the luxury lines out there. No. Bioderma is manufactured in France and sold through third party stores. The US Bioderma website does not specifically mention a blanket guarantee, so the return policy depends on the place you purchase it. 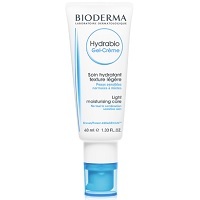 To buy Bioderma Hydrabio Gel-Crème, click here. Texture/Feel This is a really thin lightweight moisturizer with a gel base. Drying Time It dried really fast because of how thin it is! Smell The smell is really sweet, but not terribly strong. Immediate Results After the first day, my skin was slightly more hydrated and definitely softer. Long Term Results Over time, I broke out a little bit. I didn’t really see any improvement in my skin. Guarantee No. The return policy depends on the third party store where it is purchased. Price It’s $19.15 per oz.